This is my Mom's recipe for her Hefe Knoedel. About 300g plain flour, 2 eggs, salt. Make a spongy starter dough from the last three ingredients, add eggs (room temperature) salt and gradually as much of the flour as you can add to still keep it spongy. If need add a little water. Knead a little and divide it into two portions. Knead again and shape it into two oval loafs. Drop the loafs into boiling water and cook for 15 min., one at a time. Or span a clean cloth over the boiling water and steam them. When done cut into slices and serve with any gravy or sauce. Take a bowl, add a pack of dry active yeast, add about a 1/2-1 level teaspoon of sugar and about a 1/2 to a 3/4 cup of Luke warm water. When you see bubbles, add about 1/2 to 3/4 cup of flour. Stir the flour in and let it sit until you see a bubbly spongy smooth dough in about five minutes, more or less. (This is actually a prove dough to test the yeasts activity) active dry yeast should give you a great result at all times. Once you have the starter dough, mix in the eggs that are at room temperature, salt to taste (or no salt) and gradually add the 300g of flour. Add as much flour to get a nice smooth spongy dough. (If it gets to dry you might want to add a little water or if it's too wet add more flour. Knead it for a little and let it rise in a warm place until double in size. 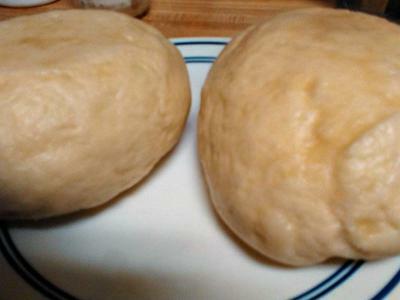 Cut dough in two pieces, knead and form two small oval loaves! Let rise until water boils. When your salt water is boiling, (use a good size pot filled 1/2 to three quarters full with water), just drop the first in the water. If you did well, the dough will swim and cook on top of the water. If you made your dough too heavy he will sink to the bottom of the pot. Boil for 15 min. Turning once. Then boil the second one also for 15 min. This recipe has a Sudetenland background. My mom made this a lot, when I was growing up in Germany. It's very easy to make. Tastes great with any gravy or sauce. We used to eat it with Sauerbraten, Peuschel, Mushroom Soup, Goulasch, and Kuttelfleck suppe (cow stomach soup). Can not wait to try these.My Oma used to make these for me instead of knodel. With liverwurst sauce and called them Schneeball. I am guessing because I probably called them snowballs when I was little.So I didn't know the name to find them.